Kevin De Leon’s Campaign for US Senate is Dead – and He Knows It. It’s hard to ignore the facts: Kevin De Leon’s insurgent campaign for US Senate is in serious trouble. He is polling at only 17% among likely voters, a decline of 4% since December, and has struggled to raise money – his fundraising totals by the end of the filing period were under $450K. In contrast, incumbent Dianne Feinstein is polling at 46% and has $10 million in her war chest. De Leon’s troubles are not at all surprising. He announced that he was running for Senator in October, hoping to capitalize on Feinstein’s growing unpopularity, discomfort about her age (she would be 91 by the end of her next term) and the disconnect between her right-of-center policies and California’s leftward political shift. The difficulties of challenging Feinstein were obvious from the beginning, but it was his political miscalculations that doomed the campaign. De Leon was unfortunate in announcing his bid for the US Senate just as the #MeToo movement started in earnest. Two days after his announcement, women who worked for or with California legislators issued a scathing public letter detailing the spread and the viciousness of sexual harassment at the Capitol. While the original letter did not name names, some victims have started to make their accusations public, leading to the resignation of several legislators. Among those publicly accused is Tony Mendoza, one of De Leon’s close friends and roommates in Sacramento. He has been accused, among other misdeeds, of repeatedly inviting a prospective employee to the apartment he shared with De Leon and then firing staffers who reported this conduct to the Rules Committee. While De Leon denies knowledge of Mendoza’s offensive conduct, activists have noted how De Leon had helped kill a whistle blower protection bill and have criticized the hiring of private law firms to investigate these allegations. His proximity to these sexual harassment scandals helped dull enthusiasm from his candidacy from the start. Just as serious a problem is that Kevin De Leon apparently failed to anticipate how forcibly Feinstein would try to shut down his campaign. Reportedly, the Feinstein camp leaned heavily on campaign professionals statewide with the message “dump Kevin or you will never work in politics again”. What is certain is that within a fortnight of announcing, two of his long-time consultants, election lawyer Stephen Kaufman and fundraiser Stephanie Daily, distanced themselves from De Leon. His sources of campaign talent became significantly limited. Endorsements, too, dried up: his website does not even include an endorsement page listing his supporters. Kevin De Leon has always been a prolific fundraiser and had relied heavily on donations from corporations and from labor. He apparently felt he could continue to rely on these contributors for his Senate race. He even opened a Super PAC to help with this plan. But openly contributing to De Leon or a PAC associated with him represents quite a risk for corporations wanting to remain in good standing with Feinstein and her political network. Indeed, his SuperPAC lays empty. De Leon had also hoped that he would be able to transfer the money laying on his state campaign accounts to a PAC that would then support his campaign for US Senate, something that experts doubted would be legal. He did, indeed, transfer $477K from his Lieutenant Governor campaign account and $723K from his State Senate account to the “Golden State Progress” PAC a couple of days before announcing his run for US Senate. These funds, however, were recently returned to the original state campaign accounts. Meanwhile, De Leon’s reliance on donations from corporations has raised distrust with many in the anti-corporate/Berniecrat wing of the Democratic Party, not eager to replace a corporate senator like Feinstein with another one. If De Leon continues his campaign, he has an even larger problem brewing. Several years ago, De Leon was caught in a corruption scandal that led to the conviction and incarceration of his close friend and ally Senator Ron Calderon. According to the FBI, in exchange for Calderon not seeking the chairmanship of the California Latino Legislative Caucus (so that Ricardo Lara – now running for Insurance Commissioner – could retain it), De Leon arranged for the Latino Caucus to transfer $25,000 to a consultancy firm owned by Tom Calderon, a former legislator and Ron Calderon’s brother. Tom Calderon himself later plead guilty to money laundering charges. De Leon also promised Ron Calderon that he would offer him a paid appointment after his Senate term was over. De Leon was never charged for corruption, but he did testify against Calderon before the grand jury and was slotted to testify against him if his case had gone to trial. This scandal has been mostly forgotten, but the word in political and legal circles is that there is additional material that incriminates De Leon. Political insiders believe that the Feinstein camp is waiting until the end of the filing period before releasing such material to the media, if they have indeed acquired it. Of course, at this point it’s only speculation that the material exists and that it will be leaked. Even if he manages to avoid this scandal from spilling over, Kevin De Leon’s best, and perhaps only, hope of keeping his campaign alive is to obtain the endorsement of the California Democratic Party (CDP), which is meeting for a statewide endorsing convention in San Diego at the end of February. As the endorsed candidate, De Leon’s could ask his corporate and labor donors to make financial contributions to the CDP. instead of De Leon’s campaign. De Leon could dictate how the money would be spent, including on mailers and TV ads for himself. These contributions would be reported as contributions to the Party, and mixed in with the contributions earmarked for many dozens other endorsees, making it practically impossible to tie any particular donor to De Leon. While this is not strictly legal, there are few paper trails and the Party has managed to escape serious sanctions for these actions election after election. Unfortunately for De Leon, he seems unlikely to gain the Party’s endorsement. 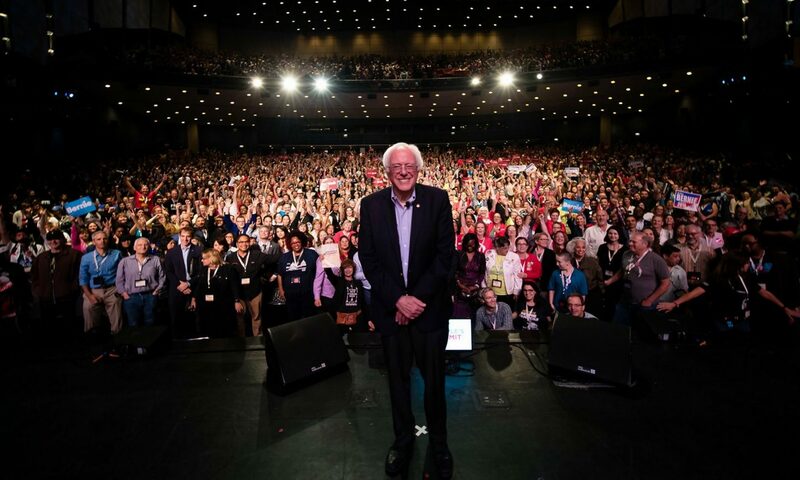 While he will have the votes of many labor activists, left-leaning party insiders and some Berniecrats eager to see anyone but Feinstein in that Senate seat, he simply does not have enough internal support within the Party to get the 60% of the delegate vote needed to secure the endorsement. Despite being the President of the Senate, De Leon is not particularly well known among Party activists, he has only started making efforts to reach out to delegates recently, and establishment party activists are usually reluctant to vote for candidates they don’t see as being viable. I think that we are long overdue for a debate on the issues, the values, and the priorities that we care about. It’s been more than a quarter of a century since we’ve had that debate. That is the language of a protest candidate, one that is running as a symbolic choice or to push the leading candidate in a particular direction. It is not the language of a real contender, who would speak of action rather than debate. De Leon didn’t start this race as a protest candidate, his change in rhetoric thus indicates his acceptance of this role. This should help him maintain the goodwill of Feinstein voters, who constitute 67% of registered Democrats, according to the most recent poll. Given the current scenario, it is possible that De Leon will remain in the race until after the Party’s Convention in late February, in order to deny Feinstein the Party’s endorsement – which would justify his candidacy in the first place – and then he exit the race. This is particularly likely if a big-name Republican enters the race, as they could consolidate the 30% or so of the vote that goes to Republican candidates in statewide primaries, and thus advance to the general. Republicans are eager to find a serious candidate to run for the US Senate, fearing that without one Republican voters will stay at home and not vote for down ballot races. Still, none have shown up so far and the deadline for submitting a candidate statement to run for US Senate is February 14th. If De Leon does decide to end his campaign, and provided that he is swift and gets a sympathetic ear at the Secretary of State’s office, he might still enter the race for Lieutenant Governor. De Leon had originally opened a campaign committee to run for that office which has $2.7 million at his disposal, were he to run for that office. His State Senate campaign has another $800K. The current three Democratic candidates for the office are unknowns, and only one of them holds elective office. De Leon has gained some name recognition and press from running for Senate and he would have a very good chance of winning that race. 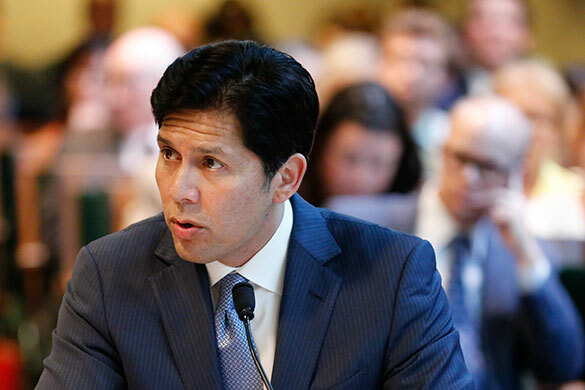 The conventional wisdom is that if Kevin De Leon remains in the ballot, he will gather the second largest amount of votes at the primary and make it to the general election, even if forced by his fundraising to wage a low-key campaign. However, he may not be so fortunate. The second place spot is just as likely to go to civil rights attorney Pat Harris, a Berniecrat who has quietly been waging a grassroots campaign for months. Like many others in the Berniecrat movement, Pat Harris got into politics to fight the corrupting power of dark money in politics, which he understands as the “greatest threat to our democracy”. A long time progressive, also running on a platform of single-payer healthcare, strong environmental regulations and criminal justice reform, Harris has been crisscrossing California in a solar powered bus, talking directly to voters. His campaign is mostly self-funded – Harris has been very successful in his legal practice – and he will not take any corporate donations. As commendable as a grassroots approach to campaigning is, it’s unlikely to be successful in a statewide race in a state as large as California. However, probably unbeknownst to him, Pat Harris has an ace on the hole that could propel him to November: his name. To understand why, you need to remember David Evans. “Who is David Evans?” you ask. Beats me. To this day all I know about David Evans is his name, his ballot designation of “chief financial officer” and the fact that he got over 21% of the vote in the 2014 race for California Controller. He came within a point of beating John Perez, the then Speaker of the California Assembly, and Betty Yee, a member of the Board of Equalization that would go on to win the seat. Evans was not only a complete unknown, but he spent pennies on his campaign. He won 21% of the vote – a greater percentage than what De Leon is currently polling at – on account of his generic name and his ballot designation alone. This example, and many others from local races, accentuate the often ignored importance of name familiarity. You might not quite remember who David Evans, or Helen Foster or Dan Jones is – but if you see their name on a ballot, chances are the name will sound familiar. Pat Harris‘ is not only a generic name, but it also happens to be rather similar to Kamala Harris, the name of the last candidate to be elected as the US Senator from California . Kamala ran as Attorney General, Pat Harris will run as some sort of Attorney. And while “Kevin De Leon” is a clearly masculine name, “Pat Harris” is far more androgynous, which might lead voters who don’t want to vote for Feinstein but want to vote for a female candidate, to unwittingly vote for him. It is truly impossible to know how many voters will support Pat Harris based on his name alone. – or on any other factors. He was not included in either of the polls that measured Kevin De Leon versus Dianne Feinstein. The Controller’s race was very different as it lacked an incumbent, David Evans ran as a Republican, rather than a Democrat, and many voters don’t even know what the Controller does. Still, it does suggest that at least 22% of primary voters are willing to vote based on the name of the candidate and their ballot designation alone.